Sometimes jazz and rock musicians need more technique than they think,because every year, heavy metal, fusion, blues and jazz styles increase in complexity and sophistication. In this new lesson, I show many different technique that I learned in the past, not only playing jazz lines, but also Malmsteen , Holdsworth and Jimmy Page’s licks. In my experience, it proves that playing in a variety of styles and contexts and keeping our minds open is better for our musical careers. 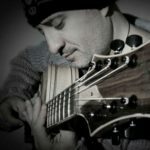 Techniques like Legato, Economy Picking, Sweep Picking, and Hybrid Picking are covered with many examples and pdf’s . Finally, in this clinic, I expree that Technique is only a door for entry to a new musical world, but never is a goal in itself. With a little practice, you will become a better musician, no doubt about it.